"The church neither sponsors nor recognizes these daily heathen gymnastics which take place at Massabielle." Whether one believes in miracles or not, the notorious shrine at Lourdes, France holds an undeniable fascination. In this classic adaptation of Franz Werfel's bestselling novel, we take a look at the intriguing tale of visions and supposed miracles, as well as the inception of Jennifer Jones' stardom in an unforgettable portrayal. 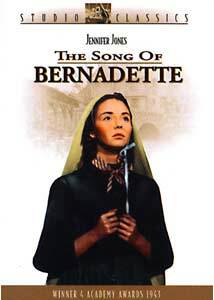 In early 1858, Bernadette Soubirous (Jones) is a sickly and feeble-minded peasant girl in Lourdes, stuck with her family in grinding poverty. One day while collecting wood at the local dump at Massabielle, Bernadette sees a vision of a Lady, who asks Bernadette to come back 15 days in succession. As the word gets out about Bernadette's daily pilgrimage, she develops an ever-increasing following, much to the chagrin of the local politicians and church, who feel that she is bringing their locale into ridicule. This contempt is magnified when Bernadette declares she has been told by the Lady to wash in a spring that doesn't exist. When Bernadette digs with her hands, she uncovers a spring, which seems to have miraculous healing powers. But Bernadette's suffering for her visions is not over by any means. Although appropriately reverential at sights of the Lady (whom the populace considered to be the Virgin Mary, though Bernadette herself never claimed that), the film takes an uncompromising look at the social structure at the time; the venality and envy of the established church, as expressed through the Dean of the church, Peyramale (Charles Bickford) and Sister Marie-Thérèse (Gladys Cooper) is often brutal in character. In particular, the nun's viciousness toward Bernadette is deeply affecting, since Bernadette as portrayed here is both utterly convinced of her visions and completely innocent. Whether this is a reflection of the actual history or simply an echo of the traditional association of holiness and the mentally challenged. Also entertaining is seeing the comeuppance of the politicians who first try to prohibit the processions to the spring, and then try madly to capitalize upon them. The theme of the difficulty and dangers inherent in genuine faith, as opposed to Sunday churchgoing and moralizing, is well-established and profoundly moving. The world of Bernadette is brought to realistic and highly complex life. Jones herself is wonderful, despite having the difficulty of a fairly limited character to work with. She's endlessly appealing throughout, and nicely masquerades as an apple-cheeked teenager. Her Best Actress Oscar® for this role was well-deserved. Bickford and Cooper are excellent as well, and the always entertaining Vincent Price and Lee J. Cobb make up part of the political elite of Lourdes. Director Henry King's pacing is slow and meditative, but the story and the performances propel the film along quite well indeed. The film is of epic length, and originally was given a roadshow treatment. For unknown reasons, the original overture by Alfred Newman is omitted, although his exit music is retained over a black screen. Image Transfer Review: The transfer, taken from a nitrate dupe negative (the camera negative no longer exists) is quite attractive, with good black levels and a wide range of greys. On occasion, white highlights are a little blown out, and mild aliasing is sometimes visible. But very little frame damage remains visible after extensive video restoration. The result is quite satisfactory. Audio Transfer Review: The original audio is somewhat deficient, with moderate noise and a slight warbling sound audible at times. A low crackle is also present, though dialogue is generally quite clear. Newman's score generally sounds quite good, with decent bass and presence, though the strings tend to be a shade on the shrill side. Both 2.0 stereo and mono English tracks are provided; frankly I preferred the mono version since the noise seemed less pronounced. Extras Review: Fox provides an enormous quantity of high-quality extras with this release, upholding the excellent traditions of the Studio Classics series. First up is a highly informative commentary that runs the full-length of the (long) picture, and contains a wide variety of information regarding Lourdes, Bernadette, Jones, her husband David O. Selznick and the score by Newman. The one failing is that frequently when John Burlingame is making observations about Newman's score and particular themes, they're not clearly audible on the track, requiring the viewer to swap audio tracks and return to the commentary in order to follow his comments properly. An episode of A&E's Biography series (44m:22s) focusing on Jones gives an in-depth look at her troubled life, plagued with suicidal tendencies and the successes and difficulties that resulted from her career being so closely tied to Selznick. As of the date of production in 2001, Jones was apparently still in good physical and mental health, making it sad that she didn't take part in this DVD release. Her reminiscences would certainly have been welcome, even if it were only a brief interview rather than a commentary. A period Movietone newsreel of Jones accepting an award from GIs during World War II is also included, as are a trailer from a 1958 rerelease and trailers for all the other films in the Studio Classics series. Finally, a restoration comparison with split-screen provides a very graphic display of the extensive restoration work (both on film and video) that was necessary to make this disc look as good as it does. The improvement over the 1993 master is very significant, with much crisper detail present in the new transfer. Fox has yet another winner in its Studio Classics series. Despite a somewhat noisy soundtrack, the film is presented in a nice transfer and with a ton of extras. A must-own for any DVD library.